The Grand Budapest Hotel is a rarity in cinema; a movie about a hotel that doesn’t feel stagey. From its (near) namesake Grand Hotel through to Neil Simon’s ‘Suite’ trilogy, the hotel has often been an excuse to bring theatre into the movies. This is probably true of any self-contained interior that can be easily reproduced on stage, but it’s a particularly popular setting in movies. The test of any hotel movie would seem to be whether it can cast off the theatrical trappings of its location. Filmmakers have done this by making the confined atmosphere part of the effect, as in horror movies Psycho and The Shining. From Carry on Abroad to Four Rooms, they have pumped it full of farce so that there’s always fluid action in the frame. They have also remedied staginess by making more of the camera, as with The Last Laugh’s experimental moving camerawork. The Grand Budapest Hotel learns all these lessons and invents a few more. When we are in the hotel, each frame is in constant motion, whether it is the incessant pacing of Gustave and his staff around the interior or the camera’s multi-directional tracking of the building’s many levels. There is a spacious depth and openness to the hotel that would preclude it from being a set in all but the vastest stadium, seen in the wide-angle dining room floor and final shootout across the chasm of the dome ceiling. All barriers and restrictions to movement seem to disappear in the face of continual action, with conversations held in open windows between floors and locked doors capitulating upon approach. It’s also a place that is always changing. We see the Grand Budapest in different eras of design and phases of popularity, through ongoing management changes and turbulent periods of history. Anderson makes the most out of small spaces. In The Darjeeling Limited, he staged a travelogue in the cramped conditions of a cross-country train and here a chase of boundless energy ensues through a series of confined spaces, not least in the elevator and narrow quarters of the hotel. 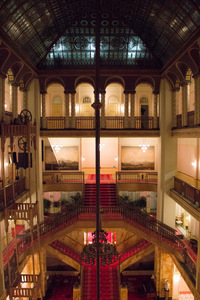 The hotel is just one of many set pieces in the movie in which characters are pushed into ever more reduced spaces; prison cells, water pipes, laundry chutes cable cars, confession booths. The stop and start of the hotel’s life where every pause is a call to motion - as in Gustave’s nightly sermons interrupted by mass-feedings - is the perfect metaphor for the movie’s narrative, which seems an ongoing stream of action full of breaks and interchanges. The director elevates the miniature model set of the hotel into a continuum of seemingly endless space that immediately eschews its two-dimensional façade. Like any good hotel comedy, there’s a great deal of slapstick and visual humour but it’s delivered in a very deconstructed way that almost makes it deadpan. Critics and audiences often have a hard time figuring out Anderson’s sense of humour, since it revolves so much around a drily delivered sense of bathos rather than punchlines or pantomime. It helps here that the dialogue is witty and sharp as well as undercutting, but when applied to the visual it is much easier to see Anderson’s comedy in the unsmiling mould of Buster Keaton or Bill Murray. Gustave’s impromptu exit from police in the hotel lobby is a case in point. The humour initially derives from the absurdity of Gustave’s straight-faced attempt to escape custody indoors surrounded by police officers. Then it is his earnest progress through the hotel with police in close pursuit captured in a single shot that brings forth laughter. The director allows us to break free of the hotel as a setting without losing it as the overriding principle of the mise-en-scène. As Gustave and Moustafa escape from police, they call upon the assistance of The Society of The Crossed Keys, an international cartel of concierges for lavish hotels. A montage of concierges in action across the world gives us access to more and varied international hotels, each of which are the loci of ongoing guest and staff activity and a recognisable part of Anderson’s world of colour and casting. When in other buildings, Gustave and Moustafa still act like they are in a hotel and transform the spaces accordingly. Just see the way they service-walk through Madame D’s house or how Gustave waits on prison cells. The Russian doll-like flashback structure also permits us to see the hotel in later years as a lifeless monument to modernist décor. It would be difficult to attribute theatricality to a movie of Anderson’s, even one set in a hotel, since they are so dependent on perfectly framed and balanced compositions and camera movements that would be simply impossible to reproduce in any given moment of a play. But it’s strange that the flat, occasionally cardboard quality of the director’s sets and shots never result in staginess. This is largely down to Anderson’s capacity to breathe multi-dimensional life into spaces represented through shallow and synthetic visuals. What he does to suggest length and height in his shots is more than enough to help us imagine spaces beyond their immediate foreground. Fluency of movement and action within each shot gives us a necessary glimpse of an ongoing world beyond the tight framing. The free mobility of the camera, an homage to the ‘unchained’ variety pioneered in The Last Laugh, breaks any theatrical shackles. Most of Anderson’s movies are engaged in some kind of dialogue between stationary objects and free movement, whether it’s the houseboat trek of The Life Aquatic or the luxury train journey of The Darjeeling Limited. 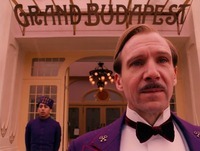 Rather than bucking the trend with a movie set in a permanent building, The Grand Budapest Hotel continues this dynamic. It’s not really a hotel movie at all but a chase movie wrapped around a hotel like a Mobius strip. The natural state of the Grand Budapest is a bustling organised chaos and it only starts to resemble a stage set once it has become a dated, depleted relic of its pre-war opulence. Like movies before it, the cinematic hotel is a place of comedy, danger and visual invention. Unlike those movies, we get a vivid sense of the world beyond the hotel walls and the many dimensions within it, as well as an awareness of its transience. This Alternate Take was published on April 30, 2014.